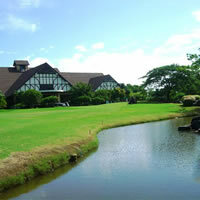 One of Bangkok's lesser-known layout's, many players are pleasantly surprised by this course that has a distinct Thai charm. There are some thrilling short golf holes including the 128 Par 3 2nd, Par 5 10th and Par 4 13th, all of which will have you writing down a high score if you lose concentration and hit a bad shot. The course is in good condition due to the lack of play, and you'll often find yourself the only ones on the course during low season weekdays. Definitely worth playing if you want to get away from the crowds. No longer great value due to the recent green fee increase, but still a nice day out. Home course for Golfthink's playing lessons, due to the fact there is almost always very few people playing it during weekdays. Course conditions getting better and better although the superintendent has an obesession with sanding the greens.